Maybe the reader has considered dropping by a local farm supply store and buying some chicks? The idea of fresh yard eggs is appealing to some people. Or maybe they want to get into prepsteading? Whatever the reason may be, more and more people are keeping backyard chickens. However, to get chickens first we have to have chicks. If someone wanted to skip the chick phase, around the start of summer check the local for sale ads and someone should be selling six month old hens that are about to start laying. For someone new to chickens, getting their first chicks can be worrisome. What do they eat? What can they be kept in? Then there is the issue of having a heat lamp. What chicken breeds are best? Let’s start from the very beginning, chicks are typically given a feed called chick starter. This is chicken feed that is high in protein and has been ground very fine for their small beaks. Chick starter also contains medicine to help chicks fend off certain diseases while their immune system develops. Personally, I feed my chicks the same crumbles the full grown chickens get, and that is laying crumbles. 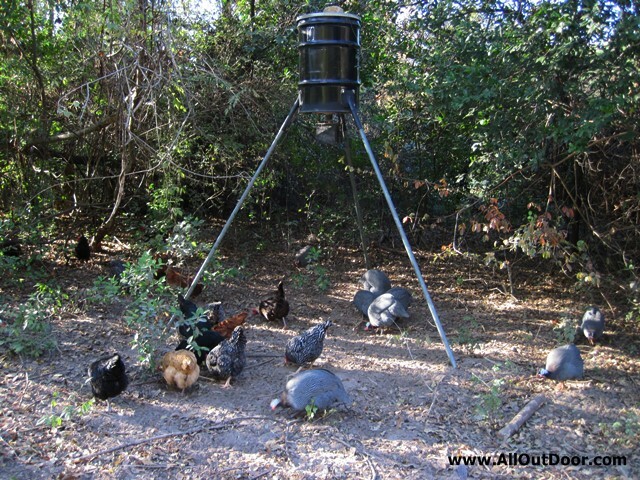 Chicks need plenty of water, so pick up a small waterer. If the waterer is too big, the chicks may get into the water bowl and get wet. 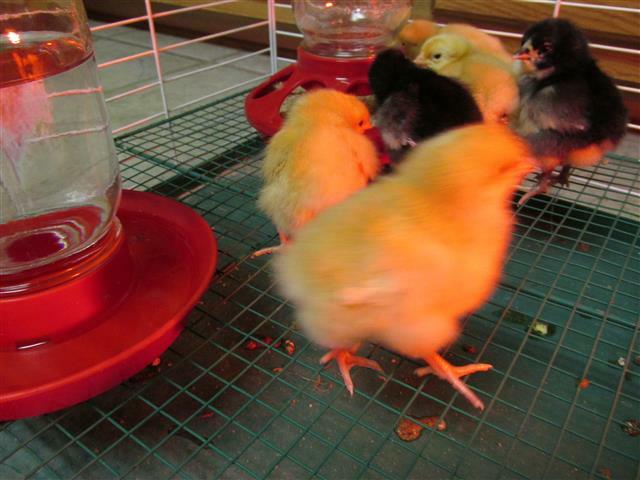 A heat lamp is required as chicks can not regulate their body temperature. The heat lamp replaces their mother who would take care of the chicks and help them stay warm. When using a heat lamp special care must be taken so the heat lamp does not catch anything on fire, nor should the chicks be able to come into contact with the heat lamp. They will get as close they can to a heat source, and may get pushed into the lamp by the other chicks. Make sure the chicks can get away from the heat lamp. This means put the lamp on one side of the cage. This is so the chicks can get away from the heat source if they get too hot. I use a large Rubbermaid tub to keep chicks in. The bottom of the tub is lined with newspaper. Chicks are messy and can create a stink rather fast. This means keeping the chicks where people do not have to smell them. Maybe keep them in a garage, bathroom, basement…. etc. Depending on the number of chicks and size of their housing, expect to replace the paper every couple of days. The chicks should be safe from cats, dogs, mice, rats, children… anything that can harm them. One of the biggest dangers to new chicks is children holding them too tight, or dropping the chicks. At just a couple of days old chicks can almost jump their body height. If a child is holding a chick, and opens their hand, the chick could easily jump and fall to the floor. The heat lamp also poses a burn risk to curious children. In short, housing should not be too hot, not too cold, and protect the chicks from danger. Some breeds do better in cold weather, while others be better in hot weather. Here in Southeast Texas, if I lose a chicken to the summer heat, chances are it is going to be the Buff Orpington. While on the other hand the Australorp seems to have no problem with the heat. People living in cold areas may want a chicken with a rose comb. This helps prevent frost bite on chickens with long combs. We can argue certain breeds are better at laying than others. For example, the Barred Rock lays less eggs than the Australorp. If the reader wants a dual purpose chicken that they may want to butcher, the Barred Rock typically has a fuller breast than the Australorp. If all the reader wants is eggs, the Leghorn is hard to beat. They are small chickens that do not make a lot of noise. Give the chicks enough room so they are not on top of each other. If the container has a wire floor, put some cardboard down so the chicks can get off the wire as it can hurt their feet. Provide a heat source, but enough room for the chicks to get away from the heat if they get too hot. 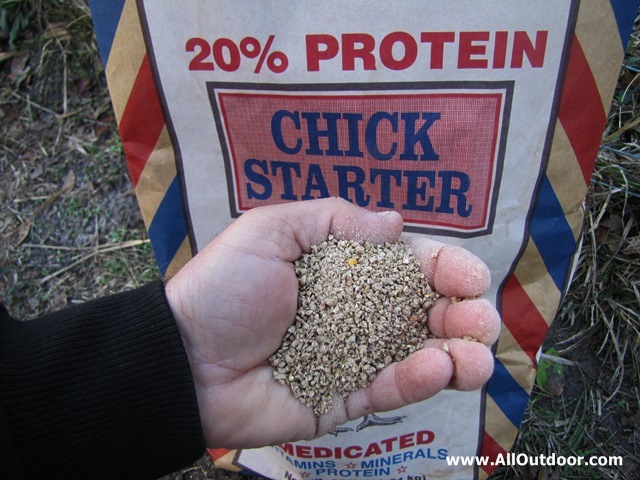 High protein chick starter and water should be available at all times. Change / clean flooring often. Be sure to post comments and questions below. The post Beginner’s Guide to Buying Chicks appeared first on AllOutdoor.com.